A great new way to play the ultimate game of strategy, whether you're a novice, intermediate or expert. 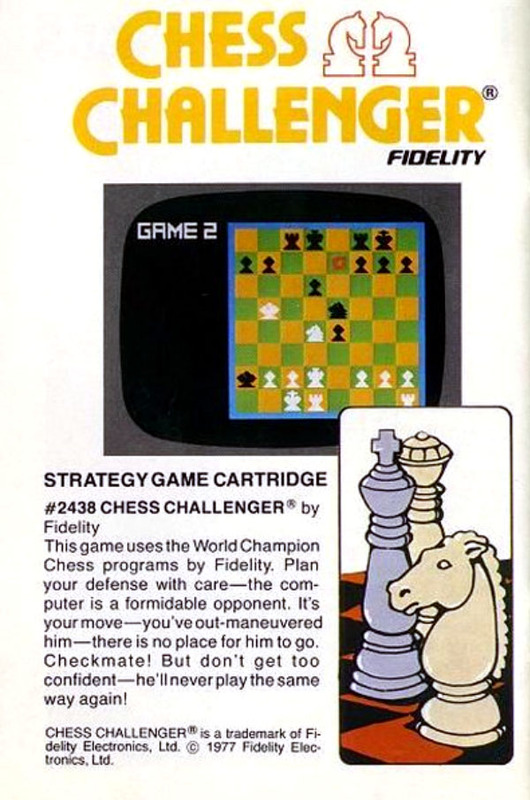 Pit your skill against the Colecovision or an opponent.The program checks for valid move and follows the full legal chess moves, including castling, promotion and en passant.Select from three degrees of artificial intelligence and move up in skill as you improve. Moreover, you can enjoy the ability to edit position in chessboard. Coleco was infamous for its vaporware offerings. These games were advertised but never published. It is not known whether the games' printed screen shots were from actual prototypes or were merely pre-development illustrations. The ColecoVision's box itself bears several examples of unreleased titles, among them Tunnels & Trolls, Chess Challenger, Side Trak, Rip Cord, Horse Racing, and Mr. Turtle. Chess Challenger was finally programmed. The programmer took inspiration from the illustration screen of Coleco’s catalogue. The game was released by Collectorvision in 2012. The author wants to remain anonymous.